The Great Orme Tramway sits in the beautiful seaside resort of Llandudno, on the North coast of Wales and on a recent break in the area, I had the pleasure of taking a trip on this wonderful piece of engineering. The Tramway has been taking passengers now since 1902 and is Britain’s only cable hauled road tram. My trip started by joining the early morning queue from Victoria Street Station. The Tramway provides a peaceful journey as you make your way through the winding streets and head towards the half way station, where I changed for the second tram which takes you to the summit. Upon reaching the summit, I experienced some truly amazing views of the Welsh coastline. 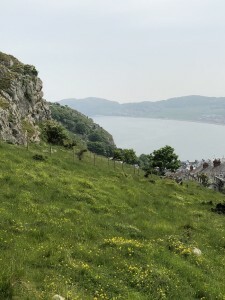 I then headed on to explore the Great Orme Visitor Centre, which is mine of information and interactive displays. The summit is also home to a restaurant and cafeteria serving a selection of drinks and snacks. After spending some time at the summit complex, I made my way back on the return trip to Victoria Station. The Great Orme Tramway is a must for any coach group when visiting Llandudno. Just make sure your passengers dress for the occasion, remembering that the temperature when boarding at Victoria Street Station can be considerably different by the time you reach the summit of the Orme. 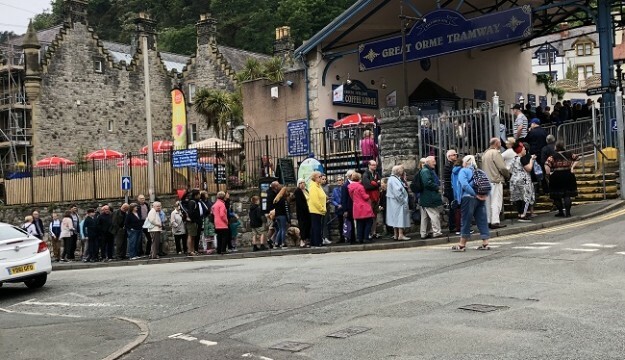 Group rates are offered for groups of 10 or more people buying a return trip ticket and coaches are asked to drop off passengers at the nearby Prince Edward Square next to Llandudno’s Pier and then take the short five minute walk to the Tramway.